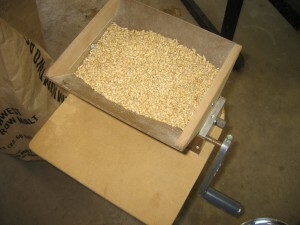 The malt you grind could end up in two (or more) brews. As we saw yesterday, if you’re going to use parti-gyle-like procedures to make a very big beer and smaller beer, the volume of the big beer is going to be fairly small. This is especially true if you plan to blend some of the first wort into your sparged wort so that you can make a worthwhile second beer. In our example, 60% of the first wort went towards “rescuing” the second beer. Today, let’s look at using parti-gyle (or parti-gyle-like) procedures for making two beers closer in original specific gravity and volume. In our example yesterday, we mashed 24 lbs. (11 kg) of malt and collected 4.6 gallons (17 L) of first wort at SG 1.080 and 11 gallons (42 L) of sparged wort at SG 1.028. Our grain bed was fully sparged, so we didn’t leave any usable extract behind and our extract efficiency should have been high. Let’s examine some other things we could have done with our two worts. There are many possible ways we could combine these two worts, but let’s start by considering our first wort. As the smaller of our two worts, and the wort containing most of the “good stuff,” it’s the limiting factor. One way to approach your brewday would be to divide the first wort in half, and then blend it to varying proportions of sparged wort. For example, you could make one beer from 2.3 gallons (8.7 L) — half — of the first wort and 40% of the sparged wort, and the other from 2.3 gallons (8.7 L) of first wort and 60% of the sparged wort. 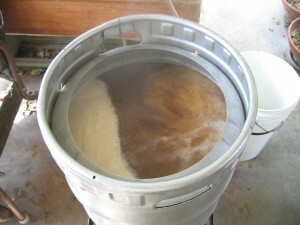 This would yield 6.7 gallons (25 L) for the first batch’s and 8.9 gallons (34 L) of the second. 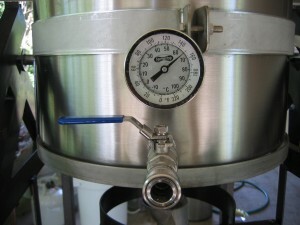 The specific gravity of the first batch’s pre-boil wort would be 1.046 and the gravity of the second would be 1.041. Boiled down, these could yield two moderate-strength pale ales, amber ales (or Scottish ales), amber lagers, brown ales, wheat beers or whatever. A 30:70 ratio of sparged wort in the two kettles would yield 5.6 gallons (21 L) of wort at SG 1.049 and 10 gallons (38 L) of wort at SG 1.040. Likewise, a 20:80 ratio would yield 4.5 gallons (17 L) at SG 1.055 and 11.1 gallons (42 L) at SG 1.039. Boiled down, these could yield a fairly strong ale and a session beer. The size of your kettles may affect the blends you can produce. There are other ways you could approach this. For example, maybe you have two 10-gallon (38-L) kettles and you need both the volumes to be equal. In that case, you might add one-third of the first wort to one kettle, two-thirds of it to the other, and fill them to equal volumes with the sparged wort. In this case, you’d have 7.8 gallons (30 L) of pre-boil wort at SG 1.038 and 7.8 gallons (30 L) at SG 1.049. “C” is concentration (use “gravity points) and “V” is volume (use whatever units are convenient). See yesterday’s post for a worked example. For example, if you have 7.8 gallons (30 L) at SG 1.038, what would your OG be if you boiled for 1 hour and ended up with 6.5 gallons (25 L)? You can get two or beers from your mash very brewday — but don’t used sparged wort by itself to make a beer. If you have two kettles and a reasonably large mash tun, you can crank out two brews every brew day. And, if both worts are a blend of first wort and sparged wort — with the minority wort comprising at least 20% of the blend — both of the beers can be of acceptable quality. The closer in specific gravity the two beers are, the closer in volume they can be and the higher percentage of first wort in each.